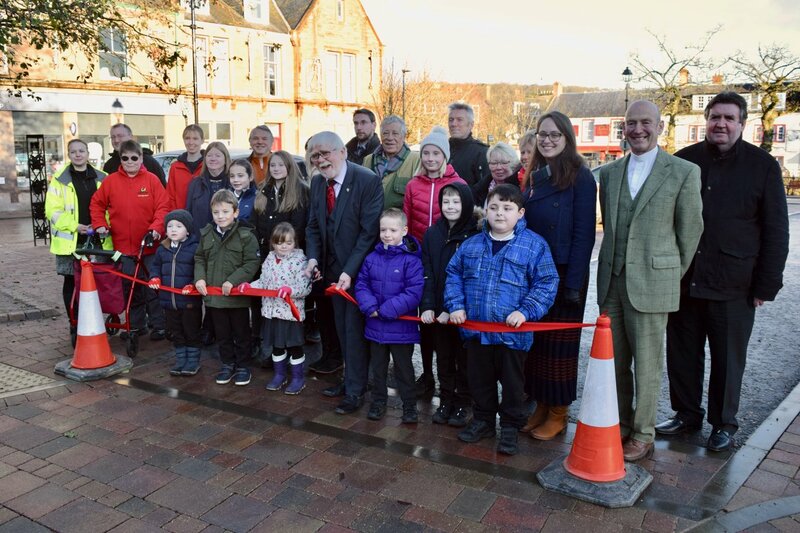 The official opening of the Market Square Regeneration Project on 3 December 2018 followed several years of work by local groups including Alyth Development Trust (ADT), Alyth Community Council (ACC) and Alyth in Bloom (AiB) in conjunction with Perth & Kinross Council (PKC). The project grew out of the Alyth 2020 consultation which took place in 2010. This included a door-to-door consultation carried out by local volunteers and public events. The output of this consultation was confirmed by further engagement in partnership with Alyth Community Council and Perth and Kinross Council in 2013, starting with a Placecheck walk about by key community groups and Council staff, after which draft designs were drawn up and displayed during a three-week exhibition in four venues throughout Alyth. Also an accessibility audit took place to ensure everyone’s needs were taken into account. Further work on the concept involved the walking and cycling charity Sustrans and the community planning and citizenship charity PAS. Sustrans commissioned PAS to help ADT with a series of community engagement events in January 2016. The aim of the engagement process was to bring the community together to consider the future of their town, in particular to identify the need for active travel infrastructure. The key findings of this work provided the basis for a comprehensive regeneration plan which was drawn up during extensive discussions with ADT, PKC and ACC, and the plan was then subject to further community consultation in May and June 2018. The first phase of the plan involved replacing the pedestrian bridges washed away by the 2015 floods. This took place in 2016/2017, after which the partners focussed their efforts on the Market Square. The vision for the Square was for a flexible multi-use space designed to meet the needs of the community. Before the works started, the quality of the fabric of the Square was generally poor and overly dominated by motor traffic. The carpark, in particular, was constructed of monoblock paving and tarmac which added nothing to the character of this historic town. Footpaths and pavements tended to be narrow, cluttered with street furniture, poorly designed tree-pits and bedding areas. There were few dropped kerbs, particularly in the carpark where there were disabled parking bays (unmarked) but no dropped kerbs for disabled access. While car-parking for day-to-day use was recognised as being important, the partners were determined that the Square should be much more than just a car-park. They wanted to create a flexible outdoor event space at the hub of the community, providing a ‘sense of place’ tying into the wider historic fabric of Alyth and addressing the current inequality between cars and pedestrian traffic making the centre much more pedestrian-friendly. The ambition was that the proposed redesign of the Square should be a catalyst reviving civic pride for local residents and businesses and making Alyth an attractive place for visitors. The result of all the consultations and planning discussions was a £450,000 programme of works which began in August 2018 and was completed on schedule in November in time for the annual Alyth Christmas Lights Switch-on on 1 December. Roadways and pavements have been completely replaced and resurfaced with sympathetic materials designed to complement the historic buildings around the Square, with wider pavements and dropped kerbs to make it more pedestrian and disabled-friendly, though without significantly affecting the number of car-parking spaces. There is also a new, more accessible bus-stop in a new location, together with electric power points for events and electric car charging. Improved signage, new street lighting and noticeboards with maps of the town and district are also being installed along with new trees and planters. The end-result is a flexible public space that can be adapted to suit a variety of community uses and acts as a visitor destination. This includes events including markets, the annual Christmas light switch on, music events and craft and arts events. It even provides the opportunity to encompass the recently opened community-led time-travel oral history museum. For the future, Alyth in Bloom will be adding to the improvements with a major replanting of the burnside between the Square and the pack-horse bridge starting in 2019.